The list of carry-on limits airline passengers can carry in their cabin baggage on international flights — which currently includes liquids, gels, aerosols and creams — will soon include powdered material, the Transportation Security Administration has announced. The limit on powders to 350 milliliters, or roughly 12 ounces, the size of a can of soda, has been enforced since last summer on domestic flights when the agency began enhanced security screening procedures, including requiring fliers to place all personal electronics larger than a cellphone in a separate bin for screening. Beginning June 30, it will ask international screeners to adopt the limits on powders for fliers coming into the United States. “These measures are part of T.S.A.’s efforts to stay ahead of threats, keep passengers safe and constantly increase capabilities through a layered approach to security,” Mike England, a spokesman for the agency, wrote in an email. In addition to powders that can be used as weapons, the agency is concerned with materials that may be carried on board and used to make an explosive in flight. “Improvised Explosive Devices still pose the greatest threat to commercial aviation,” Mr. England wrote. Rather than being banned, powders in amounts greater than 350 milliliters must be checked in stowed luggage in order to fly. Those carrying acceptable amounts of powders may keep them in their carry-ons, though T.S.A. 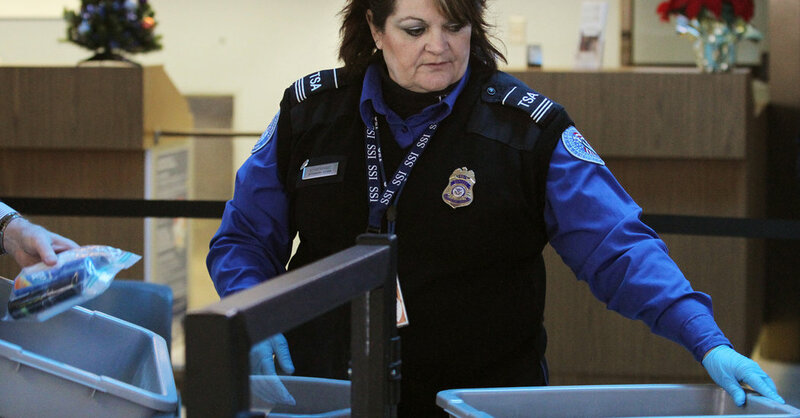 screeners may ask fliers, on secondary inspection, to place them in a separate bin for screening if they obstruct X-ray machines from getting clear images. While the limits sound generous relative to the 3.4 ounces that liquids, gels and creams are subject to, they may have an impact on travelers bringing back spices from places like Morocco, Turkey or India. They may also affect parents carrying infant gear including containers of baby powder or powdered formula and those who pack protein or energy powders or cosmetics. Gun powder is already banned from both carry-on and checked luggage. The T.S.A. publishes a complete list of permissible, limited and banned items on its website but it has yet to update its powders with the 350-milliliter limit for carry-ons, suggesting many fliers are in the dark on the regulation. New restrictions could slow down security lanes as T.S.A. agents continue to adjust to the additional screening and fliers learn about the new limits.